There are two types of people in the world: those who like to have only a few tabs open in their browser, and those who like to have a lot of tabs open in their browser. For the latter folks, we have good news. The new version of Opera has a new, smarter startup sequence, designed so the most important tabs load more than 80% faster. “Every day, millions of people start their browsers. Many of these people have more than 10 tabs open, or even more than 50 if you really use the browser a lot. With the new, smarter startup we cut away almost all the startup time for the most important tabs for you, no matter how many tabs the user has upon startup,” says Krystian Kolondra, SVP of Opera browser for computers. For more than ten years, the default setting when launching your Opera browser has been to start where you left off in the previous session. Now, with the addition of a smarter startup sequence, Opera is able to start more quickly by giving priority to the most recently active and pinned tabs. By prioritizing the tabs that are most likely to be important to you, most users will feel that they load instantly. Test results show an average improvement of 86% when testing startup time with more than 42 tabs in the previous session. 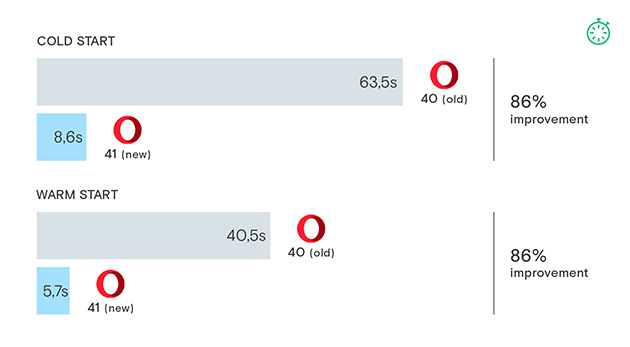 Opera 41 also comes with a range of other improvements. Video conferencing and Opera’s video pop-out feature are now powered by hardware acceleration instead of the CPU, which limits the need for CPU support and frees PC resources for other things, making the computer run more smoothly and decreasing battery consumption. Opera’s personalized newsreader – one-stop news tailored for user’s needs – has received a long list of improvements, including an option to add a source even if the user doesn’t know the exact RSS URL. Learn more about this version in our blog post. The test was performed with 42 websites open in the session that had been saved in history. A Lenovo Yoga 300 i3, SSHD 8GB running Windows 10 was used. Time was measured until the active tab was completely loaded and could be used, and the test was repeated 10 times and averages applied. A cold start means your browser has not yet been opened since restarting the operating system. A warm start happens when the browser has been closed and, without OS restart, you are launching the browser again. This is usually faster than a cold start, since some needed libraries might still be in RAM memory.